Blessed: Capuchin Father John Spiteri welcomes the PNG pilgrims to Wynnum’s Guardian Angels’ Church. A GROUP of 20 Poland-bound pilgrims from Papua New Guinea used a two-day stopover in Brisbane to say thank-you for supporting their journey to World Youth Day. For most of the pilgrims it is the first time travelling outside their remote communities. Last month The Catholic Leader featured a story about the PNG pilgrims – the remoteness, poverty and hardship of their lives, and their difficulty in raising money for their once-in-a-lifetime trip to see Pope Francis in Poland. An anonymous reader donated $10,000 to cover their final travel costs, and they have received other generous donations of warm clothes and sleeping bags from some Brisbane parishes. “I thank the Lord for working in his own ways. He has been working in so many ways,” pilgrim Fatima Jerome, a 24-year-old nurse from Alotau, Milne Bay province, said. “It is something for my life that I have never seen before. Ten of the pilgrims are from Alotau, nine from from Mount Hagen – including a 34-year-old priest – and one from Wewak. During a two-day stopover in Brisbane, the pilgrims stayed with Brisbane families and attended Mass at Wynnum’s Guardian Angels’ Church where they received a blessing from Capuchin Father John Spiteri – to “go forth and proclaim the mercy and love of Christ”. Victor Raymond, 24, from Alotau, described travelling to Poland as the biggest adventure of his life. The first-leg flight to Brisbane was his first time on a plane. “I believe God wants me to go and meet him. Not only to meet him, God wants me to be a witness for him,” he said. “I left school in Grade 10. I didn’t continue because I failed. So seeing myself as a failure I really saw my life as unworthy of anything. I joined a lot of bad groups – I even joined a criminal gang and a cult group. “Then I was picked for a youth leadership group in the Church, and after everything was done they appointed me the youth leader for Alotau, but I still didn’t know anything about the Church. 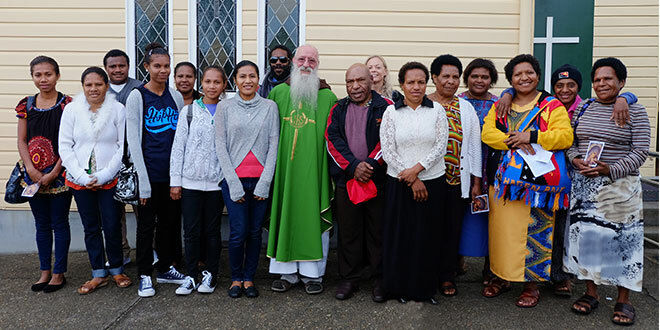 Alotau missionary and teacher Sarah Bunting, a member of the Neocatechumenal Way in the Guardian Angels’ parish, is leading the PNG pilgrims to Poland. She described their trip from remote Alotau to Poland, the homeland of St John Paul II as a “a sign of hope”. “As Christians, they have believed in the word of mercy they have received from the Church and the promise that it offers to transform their lives,” she said.